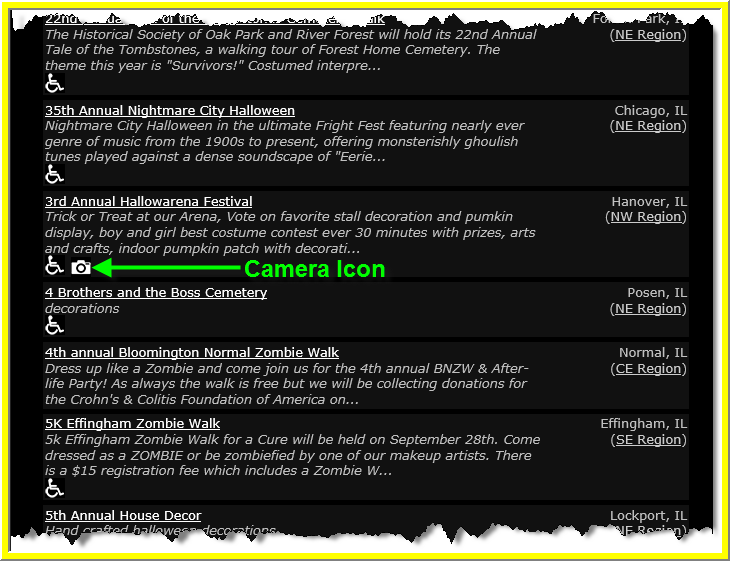 Increase visibility of your event by advertising it on Haunted Illinois for FREE!!! 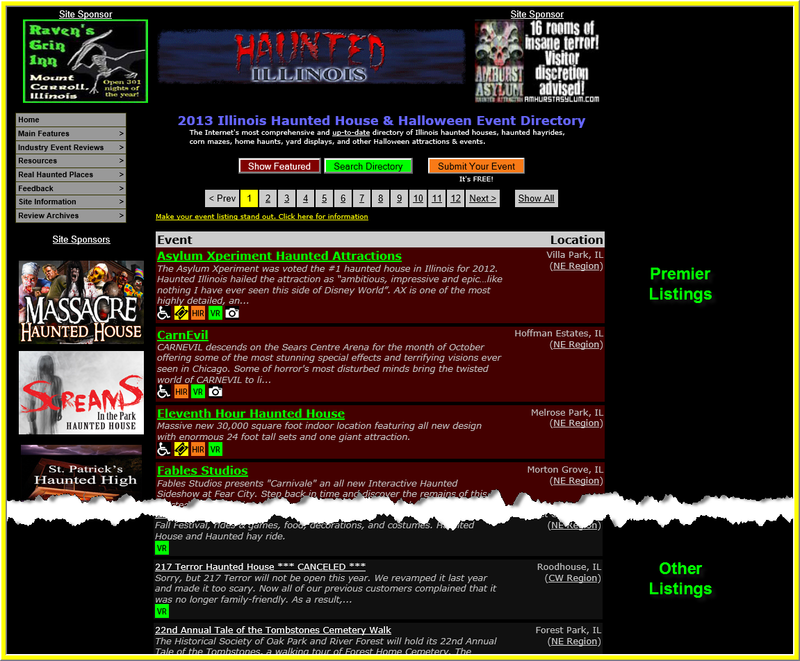 Keep in mind that Haunted Illinois' Directory lists more than just Haunted Houses. Any Halloween-related event, as long as it is in Illinois, is welcome in our directory. If you run a Haunted House, Hayride, Haunted Trail, Home Haunt, Yard Display, Festival, Pumpkin Farm, Apple Orchard or other Halloween-related event, we invite you to submit your event! Also, Google Maps have been integrated into each listing, so it's easier than ever for potential customers to find your attraction. Submitting your event to our directory is free and easy. Click here to fill out the online submission form. 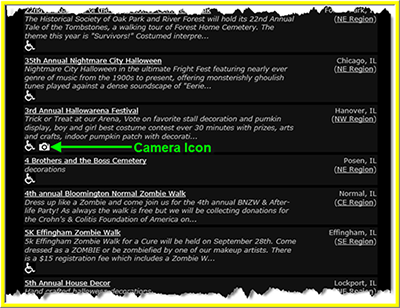 Camera symbol under your listing's title on the main directory page to indicate to visitors that there are pictures/video they can view. Listing title has a larger font than other listings, featuring bold & colored text. Premier listings have a highlighted background, to make them stand out. Interested in upgrading to an Enhanced Listing or a Premier Listing? Following the two simple steps listed below will get the ball rolling. Have you submitted your event information yet for this season? 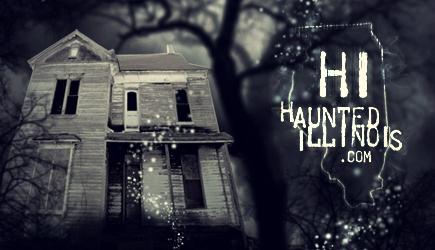 Check the Haunted Illinois Event Directory to make sure your event isn't already listed, then click here to send us your 2018 information. Fill in the online form below. Haunted Illinois will contact you shortly thereafter with payment instructions. text box to the left, before clicking the submit button. Feel free to send us an email if you have any questions about our listing upgrades.